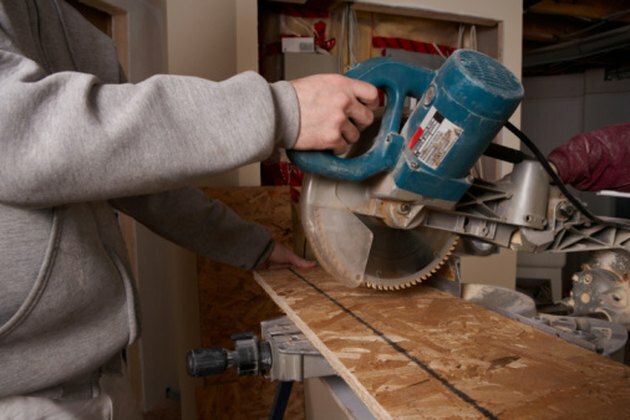 Miter saws can simplify carpentry projects and minimize the required labor. They cut very sharp and precise angles in straight lumber, molding, picture frames and corner pieces. They use an adjustable skill saw blade to cut angles of up to 45 degrees, and sometimes 50 degrees, depending upon the saw brand. The miter saw head can swivel for miter cuts, and the miter saw table can tilt for bevel cuts. However, a typical miter saw cannot cut a 60-degree angle. You can solve this problem by adding a wedge block (jig) to the fence in order to attain a 60-degree angle cut. Cutting acute angles on a miter saw requires a personalized jig. 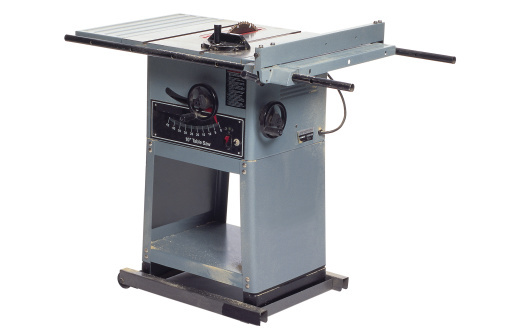 Place the miter saw on a stable work bench, free of debris and loose objects. Pull up the miter saw blade to its full extension height. Set the blade angle for 90 degrees. Take a piece of wood stock and measure it with a ruler and pencil to the approximate length of your work piece. Make sure the wood stock will be thick enough so it can be used as a backing fence (jig) for your original piece. Place the wood stock on the miter table, flush up against the rear fence. Don a pair of safety glasses.Turn on the saw and make a 90-degree cut, to your specified length. Bring the blade down gently and evenly, allowing the blade to stop before removing the stock wood piece. The wood stock should not be long enough to hang excessively over the miter table. Pull the blade up. Set the miter angle for 15 degrees on the miter table by unscrewing the lock knob on the blade and swiveling it to the appropriate number on the table scale. Place the longest end of the wood stock up against the backing fence and secure it there with the table clamps. Turn on the saw. Bring the blade down and cut through the wood. Wait until the blade stops before removing the piece. Unclasp the wood stock and position it on the table so your workpiece will abut against it. Clamp the wood stock in position with the table clamps. The wood stock will now function as your new backing fence, only it has an extra 15-degree angle on it. Place your workpiece against the new backing fence, and turn the blade adjustment to 45 degrees. The 45 degrees, plus the additional 15 degrees will give you a total angle cut of 60 degrees. Mark your workpiece with a pencil where you need to cut it. Without turning the saw on, bring the blade down and make sure the blade edge lines up on the outside of the workpiece cutting line. Turn the saw on and bring the blade down to make your cut. Wait until the blade stops before removing the piece. Use a protractor to measure your angled cut. It should be 60 degrees. Can a Chain Saw Be Used to Trim Bushes?